275 Beacon is located on the south side of Beacon, between Dartmouth and Exeter, with 273 Beacon to the east and 277 Beacon to the west. 275 Beacon was designed by Peabody and Stearns, architects, and built in1876-1877 for merchant, cotton manufacturer, and real estate developer Charles William Freeland, for speculative sale, one of six contiguous houses built in the same style: 271-273-275-277 Beacon built ca. 1876 and 279-281 Beacon built in 1881. 271-277 Beacon form a symmetrical group, with the bays of 271-273 Beacon on the west side of each house, and the bays of 275-277 Beacon on the east side of each house. Both 279-281 Beacon have bays on the east side of the house. 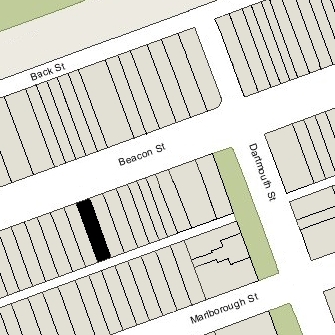 The original building permit application for 271 Beacon has not been located. The building permit applications for 273 Beacon and for 275-277 Beacon, submitted in 1876, do not indicate the name of the architect. However, the permit applications for 279-281 Beacon, originally submitted in 1877, abandoned, and re-submitted in 1881, indicate that Peabody and Stearns was the architect of these houses, and it is reasonable to assume the earlier four – which are of the same design — also were designed by them(in his Houses of Boston’s Back Bay, Bainbridge Bunting indicates that all six houses were designed by Peabody and Stearns). Click here for an index to the deeds for 275 Beacon. Charles W. Freeland is shown as the owner of 275 Beacon on the original building permit application, dated November 1, 1876. On December 1, 1877, it was purchased from him by Charles Edward Powers, and he is shown as the owner on the final building inspection report, dated December 21, 1877. He and his wife, Harriet Ellen (Nellie) (Fessenden) Powers, made it their home. They previously had lived at 381 Beacon. Charles Powers was an attorney and president of the Middlesex Railroad. Charles and Harriet Powers divorced in the late 1880s. He continued to live at 275 Beacon until his death in August of 1892. On November 12, 1892, 275 Beacon was acquired from Charles Powers’s estate by Caroline M. (Patten) Shillaber, the widow of real estate investor Jonas Green Shillaber, and their children, William Green Shillaber, Charles Patten Shillaber, and Katharine B. Shillaber (her share being held by her brothers as trustees under Jonas Shillaber’s will). Caroline Shillaber lived at 275 Beacon with William Shillaber and Katharine Shillaber, both of whom were unmarried. They previously lived at 131 West Chester Park. In 1897, they were joined temporarily Charles Patten Shillaber and his wife, Helen Starr (Camerden) Shillaber. He was a shoe manufacturer. 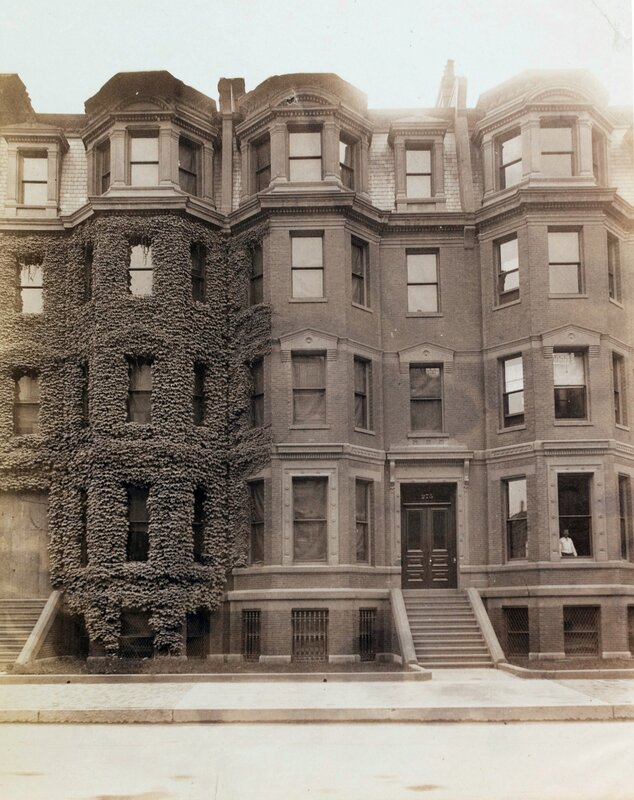 In 1896, they had lived at 339 Beacon, and by 1898, they had moved to West Roxbury. Caroline Shillaber died in July of 1898. William Shillaber and Katharine Shillaber continued to live at 275 Beacon. William Shillaber was Boston agent for the Rumford Chemical Company of Providence. He retired after his mother’s death and devoted himself to the management of the Shillaber properties. On November 4, 1912, Charles Shillaber transferred his interest in 275 Beaocn to his brother and sister. William Shillaber died in February of 1925. Katharine Shillaber continued live at 275 Beacon, but spent her winters at the Hotel Canterbury at 14 Charlesgate West. By the 1927-1928 winter season, she was living there on a year-round basis. On November 2, 1926, 275 Beacon was purchased from Katharine Shillaber by Charles H. Hemenway. 275 Beacon was not listed in the 1928 and 1929 Blue Books. 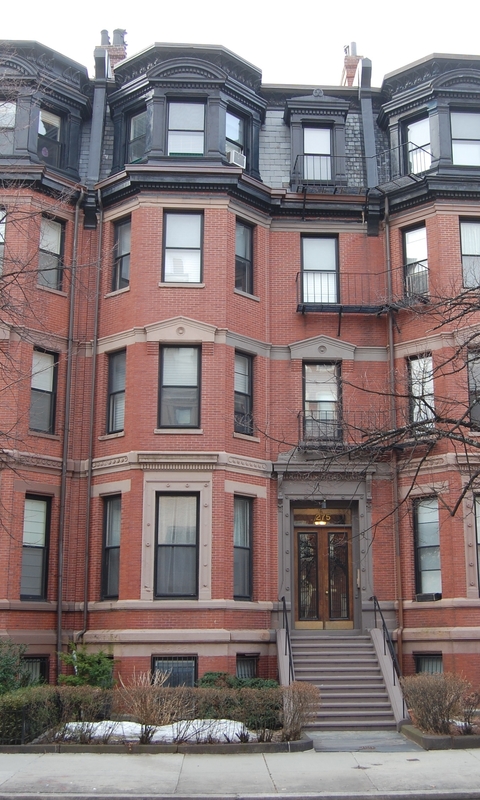 On March 15, 1929, it was acquired from Charles Hemenway by John A. McLeod, and on October 25, 1929, it was acquired through foreclosure by real estate dealer Edward J. Ball, who transferred it to his wife, Ethel G. (Carmichael) Ball, on the same day. In July of 1929, before taking title to the property, he filed for (and subsequently received) permission to convert 275 Beacon into six apartments. In his filing, he indicated that the prior use had been as a lodging house. The property changed hands and on September 1, 1943, was acquired by Victory Realty, Inc., one of several real estate firms owned by Julius Kalman (Kalmanovitz). In September of 1947, 277 Beacon was acquired by Primus Realty, Inc., another of Julius Kalman’s firms. In March of 1954, Julius Kalman’s real estate firms were identified as among the victims of George L. Maitland, who had been indicted for obtaining loans based on fraudulent representations. On February 6, 1956, Julius Kalman committed suicide at his home in Allston. The Boston Globe reported that the suicide was “on the eve of one of the trials growing out of the so-called Maitland loan fraud case” in which he “was to have been a star witness” for the prosecution. On March 29, 1957, Victory Realty transferred 275 Beacon to Jennie Loitman Barron, Mark R. Werman, and Jacob Grossman, executors of the will of Julius Kalman. On August 1, 1958, 275 Beacon was acquired from Julius Kalman’s estate by Max Ross. He also acquired 277 Beacon from the estate on the same day. In September of 1958, Max Ross filed for (and subsequently received) permission to increase the number of units at 275 Beacon to ten. He noted in his application that the legal occupancy was six units, but that when he bought the house, it already had nine, and he proposed to remodel it further and create ten units. 275 Beacon and 277 Beacon changed hands and on December 1, 1980, were purchased by Robert S. Epstein, David R. Epstein, and John R. Svenson, trustees of the 277 Beacon Trust. In August of 1981, David Epstein filed for (and subsequently received) permission to reduce the number of units at 275 Beacon from ten to eight. In November of 1981, he filed to amend the plans and increase the number of units to nine. On June 15, 1982, the 277 Beacon Trust transferred 275 Beacon to 275 Beacon Associates, Inc., and 277 Beacon to 277 Beacon Associates, Inc. Robert Epstein was president of both companies. 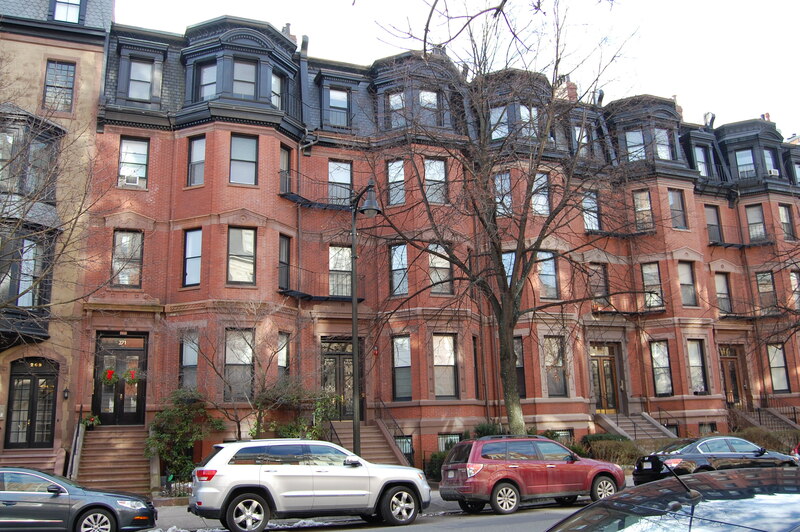 On the same day, 275 Beacon Associates converted 275 Beacon into nine condominium units, the 275 Beacon Street Condominium, and 277 Beacon Associates converted 277 Beacon into nine condominium units, the 277 Beacon Street Condominium.